I've never explicitly written about "American Psycho" - although I have talked a bit about it in some of my plan papers. Considering my movie pedigree, I feel like this blog entry is long overdue. Let me first write that I love this movie. I crave it. I watch it multiple times a year. I never get tired of it. I have bits of dialogue repeating in my head on a daily basis. I've actually used, "I have to return some video tapes" as an excuse to get out of an already awkward situation. Confession: the first time I saw "American Psycho", I hadn't read the book. As someone who was raised with a love of reading, I feel like a terrible person writing that. But wait! Don't judge me too harshly; I have since read the book. Actually, I read it almost immediately following my first time watching the movie. I needed to know - what was I missing? A movie this good must have come from a book that's twice as amazing. I opened the book, prepared to come out on the other side hating a movie that I loved. I wasn't disappointed: Mary Harron managed to get the gist of the book, work it into a movie, and not lose the key elements that made Ellis' novel superb. Impressive. But the thing she lost is the thing that made Patrick Bateman truly relatable, his fear. The movie failed to capture the supreme, unrelenting terror that drives him. His desperation. Bateman is living in a world full of pretention, populated by phonies and fakes. He's terrified to be himself. He's terrified that his peers will see him as less than themselves. He's terrified of being different. Each and every character is fighting to distinguish themselves as the best: best dressed, best apartment, best job, best car, best drugs, best friends, while somehow staying completely in step with everyone else. Keeping up with Joneses, so to speak. Be great but not too great. Be cool but not too cool. Be different but not too different. Tough world to live in. While you can see his struggles to fit in, I feel the movie really missed the depth of his social anxiety. Bateman's not really on a path of mass destruction, as the movie shows him to be, he's on a path of self destruction. Pause for a summary here: I enjoyed the book and I still love the movie. For many years, the horror genre has been attacked for numerous reasons. In the 80's, with the emergence of slasher films, audiences pounced on how degrading horror is to women. (More on this in my previous blog.) Some of us rational members of the female persuasion are simply tired of the "exploitation" arguments. Some of us appreciate horror. And some of us (Mary Harron) roll up our sleeves and jump into the mix. 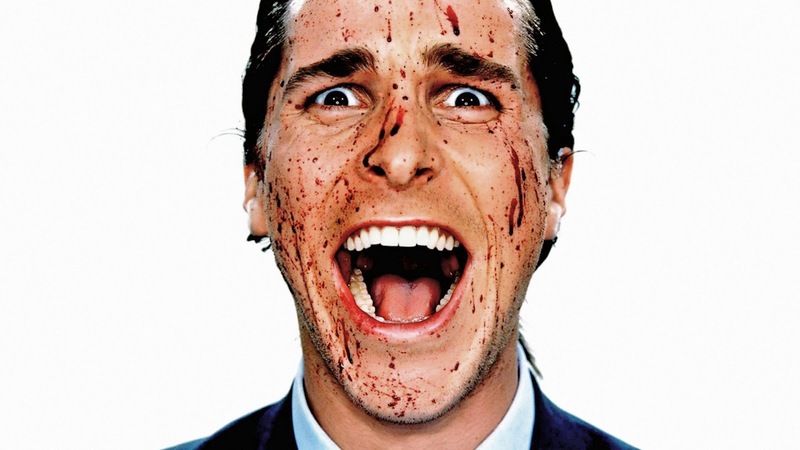 That's right, I've written it twice now in this post, American Psycho was directed by (gasp!) a woman. If you don't know anything about her, she's worth checking out - very cool lady. Christian Bale is perfect. His intonation is flat and sarcastic - you spend much of the movie wondering if he's making things up or just doesn't care. But when he does break, his panic is palpable. Finally - emotion! On a side note, I'm sad that "Batman" has ruined his career. And I know that this is an unpopular opinion as nearly every nerd out there thinks it was his best role. But I honestly feel he's gone downhill since becoming Batman. Also close to my heart is the purveyance of the theme of "the other". The outsider skirting society's rules. And a great segue into my final thoughts for today. Unlike my usual wrap up, a witty one-liner, I'd like to tangent for a moment about a horror film archetype that I find particularly interesting: the Final Girl. And with this tangent I'll answer a question I've heard about "American Psycho" many times: "Why doesn't he kill Jean, his secretary?" The quick and dirty version: The Final Girl is just as she sounds, the final living character in a horror film. Why does she live? Because she's smart, resourceful, and completely outside of society. Why does Jean escape the killing rampage? She's a lite version of the Final Girl; she does nothing special to save herself, simply being herself saves her. A psychopath can feel love but, only for a woman that society deems as monstrous as himself. And on that bombshell - I'm out.